Once in a while I stumble upon an idea that tickles my fancy; usually it has to do with a fresh idea to reuse or re-purpose and everyday item. 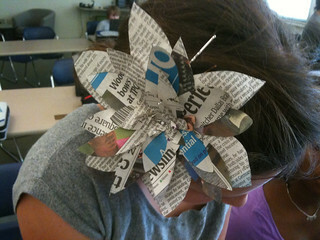 Here’s a great idea for recycling newspapers (or books or magazines) that will appeal to those who treasure words: paper roses. For me these wordy wonders have a double attraction because our cat loves nothing better than destroying real flowers and plants. With these “roses” I can have my words and whimsy without risking real, expensive blooms being strewn half-eaten across the floor. I’m looking forward to making a batch for my next dinner party–complete with a literary theme. We own a couple of vintage typewriters, so I’m thinking a centerpiece might include paper flowers arranged artfully in and around this focal point. I suppose decorating with words is better than eating them, right? What creative ideas do you have for living with words?